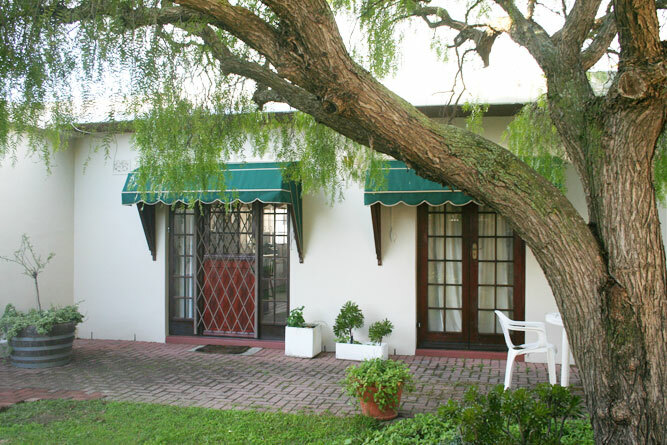 Pepper Cottages is a quiet little retreat, right in the heart of Plumstead. You would hardly know it was there if it were not for the discreet sign at the gate. The self-catering Red Pepper Cottage was to be my home for the night, and I was so glad it was. Tastefully furnished, the ample cottage would be ideal for corporate visitors or a couple needing a great base from which to explore the Mother City for a few days. There is a large lounge with a TV and doors that open onto a small garden, as well as a nook in which to work or read (with a number of good books to borrow while you are a guest). The kitchen is spacious and open-plan, equipped with a stove, kettle, fridge, crockery and cutlery. This means that the Pepper Cottages really can be a home from home during your stay in Cape Town. The bedroom is small, but has ample cupboard space and a comfy, warm bed that is irresistible after a day of travelling. The en-suite bathroom has a shower and bath, as well as complimentary shower gel and hand soap. Fluffy towels and linen are provided. There is Wi-Fi access throughout the cottage. If I had stayed longer, I would have been able to enjoy the swimming pool and braai area, which is ideal for families with little ones. There is under-cover parking available inside an area that is protected by a remote-controlled gate. Pepper Cottages is centrally situated, making it convenient. It is relatively close to Constantia and its wine farms, Blue Route Shopping Centre, Constantia Mall, and attractions that are slightly further afield – like Muizenberg, Kalk Bay and Simon’s Town. The City Bowl is just over 20 kilometres away, and the nearby motorways of the M3 and M5 mean fairly easy access to just about any part of Cape Town and its surrounds. To make a booking please see Pepper Cottages. Arlene, the owner, is friendly and available, doing her best to accommodate her guests. I arrived and left at somewhat strange hours, but she was flexible and understanding.